There are ten 8-foot benches that will comfortably seat up to fifty guests. More than that turns into 'standing room' and it's no fun for your guests to play musical chairs. There is a non-refundable $1000 booking fee required to hold your date. The booking fee will be applied toward your total balance. Payment in full is due 60 days prior to your wedding date. Weddings bookings are not refundable. Payments are accepted via check, cash, or money order. All policies apply. 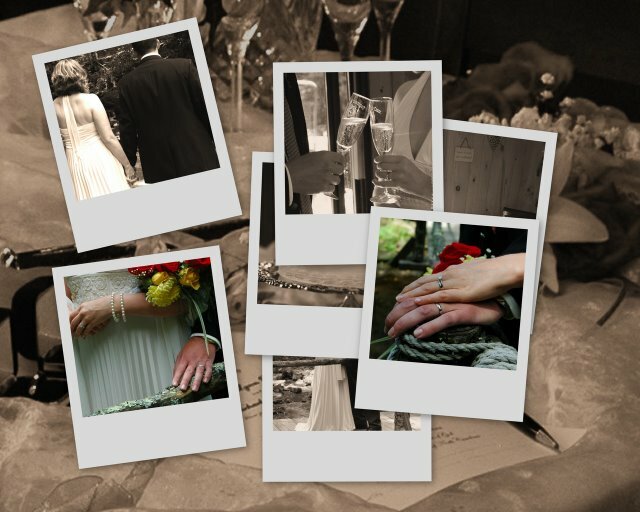 Brigadoon Wedding packages include EXCLUSIVE USE of the Brigadoon Cove property for the entire day of the wedding. 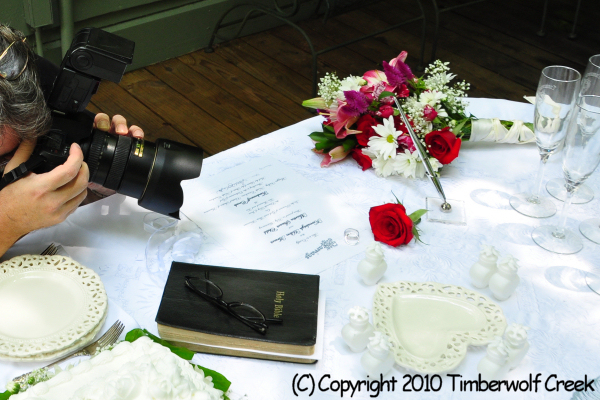 These packages also include your wedding officiant, bride's mixed seasonal bouquet and groom's matching boutonniere, and a website (for 60 days) with photos from your wedding day, including a noncommercial copyright release so you can download, share, print, as much as you like. Only registered overnight guests (max 12) are permitted on the property after 7:00pm. Thanks for understanding. If there is a light rain, we do provide white wedding umbrellas for you and your guests. These umbrellas are generously proportioned at five feet wide, so they give abundant coverage for a couple (or small family!) and the wedding faeries will also be on hand to wipe down each bench and insure that folks have a clean dry place to be seated. Because the cove is sheltered with towering hardwood trees, it takes a harsh downpour to render it unusable. In the event of such uncooperative weather, because you have the wedding cove from 3pm the day before the wedding until 11am the day after, you have the flexibility to rearrange your ceremony time. If you'd rather move your ceremony to your reception site, your Officiant will perform your ceremony there. Price will remain the same and there are no refunds for inclement weather. Over the years, we've been presented with this same scenario, each time rain is forecast: "Where is the indoor room for fifty people?" So let's just clarify - there's not a secret facility here that magically appears when it rains... Although you are welcome to arrange for tent rental & staffing. Wedding reservations are not refundable. wedding packages are prepaid, by check or money order, 60 days prior to arrival. Reservations made within 60 days are payable immediately. "Please Plan my Destination Weddingmoon!" A Weddingmoon is simply one week's lodging in The Creek House or The Black Bear Cottage in the Woods, plus the Elopement package - easy! The 'House' sleeps 8, and the 'Cottage' sleeps 4 - good to know if you want additional overnight guests. Or not overnight guests. :) That is, you don't actually have to *tell* them that they could stay... You could just invite them for your wedding day and then wave goodbye after dinner! Totally up to you. "This is EXACTLY what I want! But I only want a few days..."